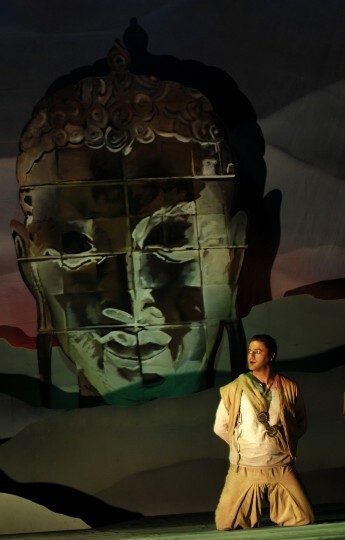 Containing one of the most famous operatic duets ever written for tenor and baritone, ‘Au Fond du Temple Saint’, a fishing village in ancient Ceylon (Sri Lanka) is the setting for Bizet's steamy tale of a tautly woven friendship, loyalty and forbidden love. 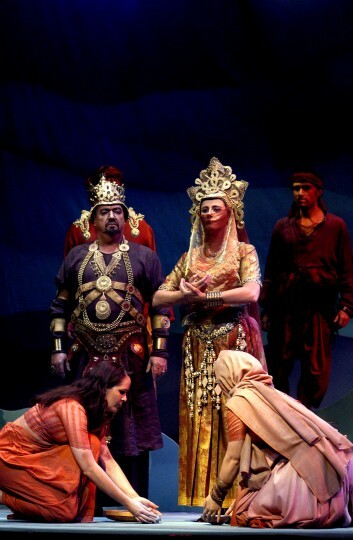 The brave fishermen, Zurga and Nadir, recall a pact they made not to pursue Leila; a woman they both loved. A veiled virgin arrives to pray for the fisherman on their upcoming expedition but the real pearl - her true identity - remains hidden. When Leila finally reveals herself, she pits the old friends against each other in a deadly love-triangle. 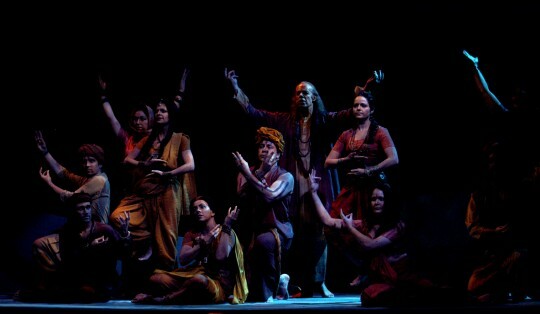 With vibrant costumes by Gabriella Ingram and an evocative set by Gary McCann, The Pearl Fishers toured to 25 venues throughout the UK. It was conducted by Fraser Goulding. Pearl of a show! If anyone was in any doubt about the marketability of opera in Huddersfield they needed to look no further than the LBT last night. It was wonderful to see the theatre packed to the rafters (yes, even those dreaded side seats) as Swansea City Opera performed a one-night stand of George Bizet’s, The Pearl Fishers. 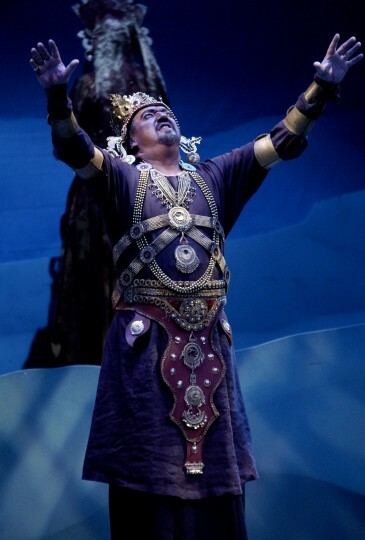 Although not his most famous piece of work (that accolade undoubtedly belongs to Carmen), Les Pecheurs de Perles has much to recommend it, not least one of the most magnificent male duets in the operatic spectrum. Au Fond du Temple Saint – is The Pearl Fishers! It has been recorded by many of the world’s greatest singers, and its performance won long and worthy applause last night. The opening bars form a recurring theme throughout and surely stir the sensibilities of every true music lover. Set in a Ceylon fishing village, the story tells of the love of two men, Zurga, the village chief and Nadir, a fisherman, for Leila, a Brahmin priestess. After quarelling over Leila, Nadir leaves the village, but on his return is re-united in friendship with Zurga “Au Fond du Temple Saint.” However, when a virgin priestess enters the village, Nadir recognises her as Leila and their love is rekindled until Zurga warns her that if she breaks her vestal vows, she will die. 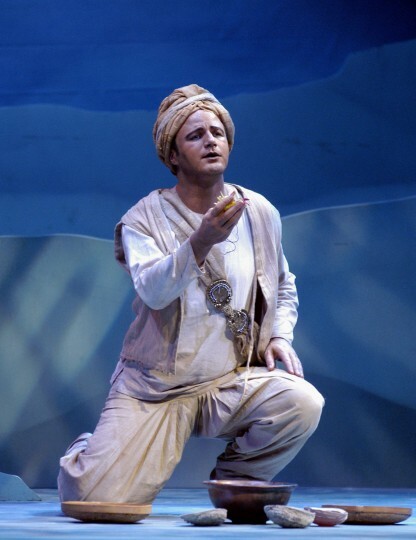 Iranian-born baritone Aris Nadirian performed Zurga’s role last night and the rich timbre of his mid-register worked splendidly with the searching tenor tone of Jeffrey Stewart as Nadir, who was oustanding ih the aria Je Crois Entrendre Encore. Alycia Fashae as Leila, thrilled in her trills and displayed a huge vocal dexterity, both in duets with the male leads and in the plaintiff love song Comme autrefois. The ensemble work by the small company was tremendous, although the orchestra could perhaps have been a little stronger, while visually the set was spartan, but enhanced by clever lighting. A splendid evening then, the only downer being the temperamental front of house curtain, which embarrassingly needed two professional opera singers to prop it open in order that the company could take their bows! And truth to tell, this one is a cracker - not only in terms of the vocal strengths and performances of its four-strong cast, but also in its visual approach and ability to engage an audience whose previous knowledge of the genre is at best sketchy. This is magical stuff, subtly delivered and never straying into the kind of overblown pretension that is so often seen in the productions of more high-profile companies. 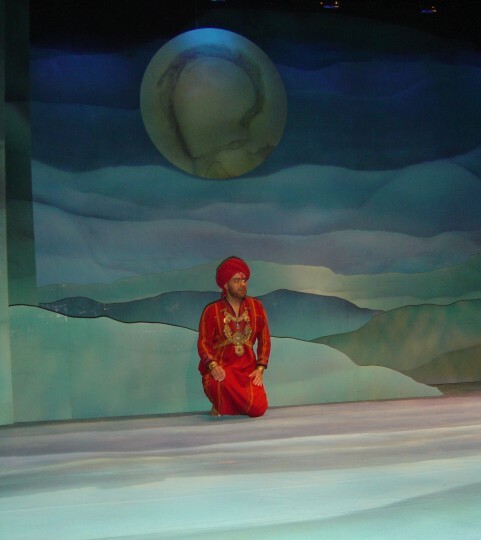 The ensemble work by the small company was tremendous…..visually the set was spartan, but enhanced by clever lighting. A splendid evening then, the only downer being the temperamental front of house curtain, which embarrassingly needed two professional opera singers to prop it open in order that the company could take their bows! And the opera itself? Utterly glorious, featuring a heavenly rendition of the duet known as Au fond du temple saint performed by the characters Nadir and Zurga.